Should Anglers Beware of Snakes Hiding Inside Fish? - Truth or Fiction? A highly popular post warns of copperheads hiding in Pennsylvania fish, but you don’t have to give up “bass thumb,” whatever that is. Anglers need to beware of copperhead snakes hiding inside the mouths of the fish the catch, per a fishing organization's warning. The warning had been spreading for years by this point, without an attendant influx of copperhead bites among Pennsylvania anglers. OKAY, WE’RE HALF COMPLETELY GROSSED OUT AND HALF FASCINATED BY RICKY STEPHENS PHOTOS OF A LARGEMOUTH BASS HE CAUGHT THAT SWALLOWED — OR RATHER HALF-SWALLOWED — A GARTER SNAKE. This is not a Copperhead. It’s a harmless Garter Snake that is identifiable by its markings, eye, and head shape. Copperheads do sometimes hang around wetland edges but they don’t tend to swim too often. So, it’s not realistic to suggest bass are eating them in great numbers. Although it is not unusual for large predatory fish to eat small snakes, they tend to be species that hang around in the water a lot. Some snakes can hold their breath for a long time, even up to 45 minutes or longer. But, they can’t breathe water, no matter how much oxygen is in it. Interestingly, sea snakes may be able to take up some oxygen from the water through their skin, but this isn’t a major strategy for other species, if they can do it at all. 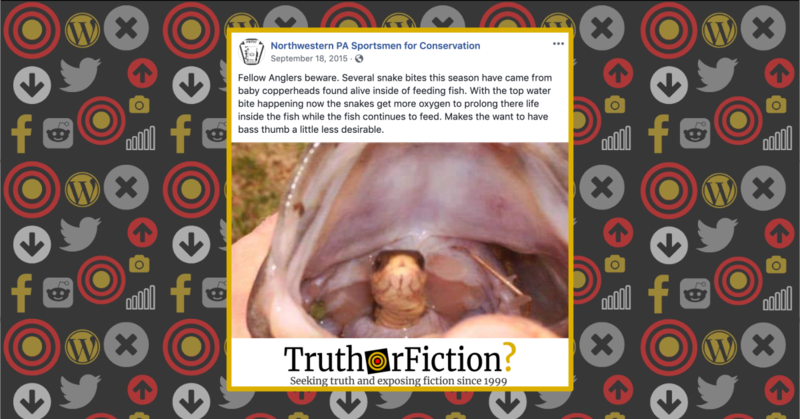 The image of a purported copperhead snake in the mouth of a caught fish has been circulating since 2015, but was originally posted with a different caption in 2009. Since the warning began to circulate, wildlife experts have denied its claims were accurate. Finally, in the years since it first appeared, we were unable to locate evidence of attendant copperhead bites sustained by fisherman bitten in the manner described — which means anglers will have to find another way to explain away their lack of “bass thumb” after a long day out on the water. Fellow Anglers Beware of Copperheads Inside Fish? Nah.